If not for her monotone voice, Supreme Court Justice Ruth Bader Ginsburg would have been a great operatic diva. Instead, she became what she considered to be the next best thing: a lawyer. The first woman to serve on the prestigious Harvard Law Review and the first tenured female professor at Columbia Law School, Ginsburg won four out of the five cases she argued before the Supreme Court preceding her appointment to the Supreme Court by President Bill Clinton in 1993. The law may be her calling, but opera was her first love. Interweaving her two passions, Ginsburg will give the 10:45 a.m. morning lecture today in the Amphitheater on the depiction of law in opera. The speech will incorporate four opera excerpts performed by the Chautauqua Opera Company’s Young Artists — who will also be onstage — which Ginsburg will use to illustrate her points. It seems life imitates art — or perhaps more accurately, art imitates law — following the announcement of a new opera, Scalia/Ginsburg. The composer, Derrick Wang, who recently graduated from the University of Maryland Francis King Carey School of Law, was struck by the idea while studying Supreme Court opinions. Wang recently gave a preview of the opera for Justices Antonin Scalia and Ginsburg, who — although they find little commonality in interpretations of the law — share a love of opera. The opera is set to premiere next spring at the Washington National Opera, of which Ginsburg and Scalia are devoted patrons. In 1994, she and Scalia even served as a supernumerary actors in a production of Ariadne Auf Naxos. 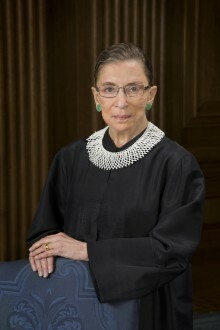 During an interview at that time, Ginsburg said her one regret of accepting her position on the Supreme Court was that she would be too busy to attend the rehearsals necessary to act as a “super.” The director of the opera house called her and told her he had an offer she could not refuse: the opportunity to act as a super without the required rehearsal time. As it turns out, Scalia/Ginsburg will be a comic opera. Lawyers are not always treated so kindly in opera, as Ginsburg plans to demonstrate during her lecture. She mentioned Johann Strauss’s Die Fledermaus, in which a lawyer — named Dr. Blind — so agitates a judge that his client’s sentence in jail is extended three extra days. Ginsburg will attending the Chautauqua Opera Company’s performance of Giuseppe Verdi’s Falstaff this evening, lamenting that the opera performed earlier this season — Benjamin Britten’s Peter Grimes — took place before the Supreme Court’s term had ended. Ginsburg was 11 years old when she was first introduced to opera. Her aunt took her and a cousin to see a traveling mini-opera at a high school. Dean Dixon conducted and managed the whole production, condensed the shows to an hour and narrated all of the action in between. Ginsburg was captivated. After her visit to Chautauqua, Ginsburg will travel to Cooperstown, N.Y., to see the Glimmerglass Opera, and then to Santa Fe, N.M., to see the Santa Fe Opera, part of a summer ritual she has performed for the past 10 years. She referenced a new opera that will show in Santa Fe titled Oscar, about the life of Oscar Wilde. At Glimmerglass, on the other hand, they are producing an early and lesser-known Verdi opera in its English translation, King for a Day.